Delft  is a mid-sized city in the west of the Netherlands. It's a beautiful, unspoiled town with traditional architecture, canals and bikes. It's also home to the world famous blue and white ceramics. Delft makes a great destination for a day-trip or can serve as a base to explore the region. And if the bustling crowds of Amsterdam are not really your thing, Delft is a lovely alternative, offering an equally interesting insight into the cultural wealth of old "Holland", on a far more intimate scale. Delft is more than 750 years old. Its name is derived from 'delven' which means delve or digging. Delft's oldest canal is called The Old Delft (de Oude Delft). Delft expanded around it; later on many other city-canals were dug as life lines through the city. These grachten are still the pride of Delft. In 1246 Delft received city rights, granted by Holland's Duke William II. Delft grew prosperous and new neighbourhoods were added to the city. In 1355 it reached the size it would remain at until the 1900s. In 1536 a great fire destroyed 2300 houses. The most likely cause was lightning striking the tower of The New Church. About 100 years later, in 1654, an explosion destroyed large parts of town; a warehouse with 36 000 kg of gunpowder blew up. A new warehouse (Kruithuis) was later built, outside the city perimeter. Delft has long been a centre of art and science. With the foundation of the VOC (Dutch East India Company) in 1602, Delft also became a trading center. The VOC was at one time the largest trading company in the world, with a huge fleet and offices all over Asia. One of the Dutch offices was in Delft. In 1842, the Royal Academy for Civil Engineering (Koninklijke Academie ter opleiding van Burgerlijke Ingenieurs) was founded. Now known as Delft University of Technology (TU Delft), it is Delft's biggest employer. About 17,000 students study in Delft. Amsterdam Airport Schiphol is 45 min away by train. For Delft, you have to change at at Leiden Centraal or The Hague Hollands Spoor (which is called Den Haag HS). If you prearrange a taxi to pick you up at Schiphol, expect to pay €60 to Delft. For a one way trip by train, the fare is €9,50. Rotterdam The Hague Airport is only a few kilometres away but has poor public transport connections. RET city bus 33 runs frequently to Rotterdam Centraal Station and takes you there in about 20 min. From there it's a 20 min train ride. When taking an airport taxi from Rotterdam The Hague Airport, expect to pay about €35 for the trip. Other, cheaper, options are prearranged taxis from Delft. From 2010 till 2015, there will be building works in progress as a new train tunnel is being built through Delft. This is a large project, severely affecting the flow of traffic and parking. Because of this the bus station and taxis are now at the back of the train station. Delft is a short tram ride from Den Haag by tram. Tramline 1 runs from Scheveningen, through the middle of Den Haag and Den Haag HS to Delft. Travelling time is approximately 20 min from Den Haag to Delft. From Scheveningen to Delft takes about 45 min. Tramline 19 runs from Leidschendam, avoiding Den Haag. Tell the driver your travel plans so that he can sell you the best value ticket. On the trams you now must use the OV-Chipcard or day-pass. Buy these from the central station or ask at an information desk. Delft is easily reached by car. Coming from Amsterdam or Schiphol, it is at the end of the A4 motorway; coming from Rotterdam, Delft has three exits off the A13 motorway. The city centre is best reached via the IKEA exit. During the weekend this exit can be busy with IKEA shoppers. Then take the North exit. Buses from Den Haag and Rotterdam terminate at the Delft bus terminal, which is at the back Delft railway station because of building works at the front. Tram line 1 from Den Haag (HS) runs to Delft and has stops near the city center and railway station. Walking - the centre is small enough to walk across in ten minutes. Most streets in the city centre are pedestrianized. But do take care: taxi's are allowed to use these streets. Especially at night they drive at inappropriate speeds. When walking through town make sure you leave room for traffic on bikes. The locals are zooming around going about on their daily business.The locals are usually aware of tourists looking up at the gables and are ready for unsuspended side steps, but do try to keep an eye on the traffic. A collision with a bike can ruin your whole day. Walking around without a top is considered uncouth. The Netherlands is a perfect country for cycling. The land is flat, the views broad and cycle paths are everywhere. For the Dutch cycling is not only useful for the daily commute but also considered an excellent leisure activity. Inexperienced cyclists are few and far between - everyone cycles in the Netherlands. Inside the Delft canal streets, most locals will mount the pavement shortly to let cars past on the canals where possible. This is just courteous because the next time when you are driving the car you hope to be let through as well. At the train station in Delft you can rent bicycles. To rent a bike you will need a valid ID and a deposit (€50 for a simple bike or €145 for a tandem). The rental fee for a normal bike with a back-pedal brake will be €7,50 per day (including insurance cover for theft). Often it is possible to rent a bike with gears or one with electric assistance. Especially if you are with a group it is best to reserve the bikes per telephone (015-2143033) beforehand. Please make sure you understand the traffic rules before you set off. Halfords in town (behind the main square) also rents bikes. The old city has been made largely car-free, but there are two large car parks at the edge of the center (Zuidpoortgarage and Phoenixgarage). These car parks are expensive, but parking on the few public parking spaces on the streets in or near the city center can be even more expensive. The parking policy differs per area and is not always clear. Beware of the signs "alleen vergunninghouders" (permit holders only) in some streets in the vicinity of the city center, especially in residential areas. Sometimes only a floor tile with a "P" is visible. This means Permit parking. Many tourist assume "P" means parking and end up with a parking fine. Parking is energetically policed. Unauthorized parking will cost you about €70. If you do not mind a 15 min walk, consider parking for free in the university area. Usually at weekends there is a lot of free parking space. Traffic rules on priority consider the vulnerability of the mode of transport. This means a car has to give way to a bike to avoid a collision. Even a bike travelling the wrong way up a one-way street, without lights, driven by someone clearly over the limit colliding with a car will put that car driver at fault. Because of the risk to the cyclist, the car should have done everything to avoid the collision, or he is at fault. Be sure to check the mirrors before you make a right turn. There is a good chance a cyclist is between you and the pavement. The municipality of Delft has made a free app available for Iphone and Android. Most things here are listed in the app. Nieuwe Kerk (New Church), Markt 80, +31 15 2123025, . Closed on Sundays. Located at Markt, this church was built in 1496. The royal burial chamber is in this church but is not accessible. Prince William of Orange was the first to be buried here, after being shot in 1584. It is possible to climb the 108,75 m tower to get a impressive view of Delft and surroundings. It's the second highest church tower, after the Dom church of Utrecht. You can see both Rotterdam and The Hague and on clear days is it possible to see Leiden and even Amsterdam. It's well worth the effort. €4 for the church interior only; €3 extra to climb the tower only; a ticket here also gives free entrance to the Oude Church. On a cold day, it can remain chilly even inside the church. Oude Kerk (Old Church), Heilige Geestkerkhof 25, +31 15 2123015, . Closed on Sundays. 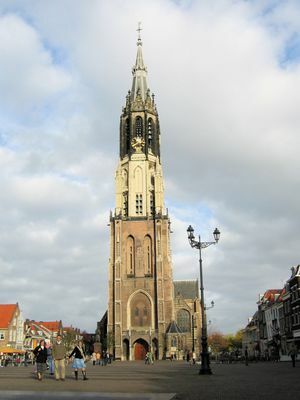 This is Delft's oldest church, being built in 1246. The interior of this church is excellent. Famous Dutchmen are buried in this church, including Piet Hein, Maerten Tromp and Johannes Vermeer. €4, which includes free entrance to the New Church. The Old Church leans out considerably over the Oude Delft canal. When the tower was built the canal had to be moved away from the church as the tower would have been half in the water. During the building works it became apparent that canal-half of the base soil was not firm enough to support the tower. To compensate for the tilt the upper part of the tower was build with a compensating counter-curve. 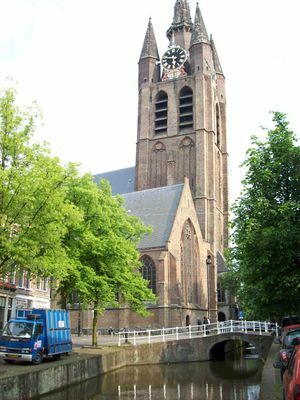 You cannot climb the tower of Oude Kerk. De Prinsenhof, Sint Agathaplein 1, +31 15 2602358, . Open Tu-Su 11:00 to 17:00. In medieval Delft Sint Agathaklooster was the biggest cloister in Delft. After 1650 it was split in two parts. Part of the chapel remained for religious service (Waalse Kerk). Prince William of Orange held court in the rest of the complex. He was killed here in 1584. Nowadays the complex houses some museums, including the city museum. €10 adults, €5 for students/teens. Vermeer Centrum Delft, Voldersgracht 21, +31 15 2138588, . The Vermeer Centrum offers a view on the works and life of the famous 17th century painter Johannes Vermeer. The souterrain houses reproductions from all of his 37 works in chronological order. On the 1st floor, you find the studio of Vermeer that shows the methods and the famous light of Vermeer. On the 2nd floor, the special exhibition "Love Letters from Vermeer" reveals secrets from several famous paintings. Open all days from 10:00 to 17:00 except 25th December and 1st January. Synagogue, Koornmarkt 12, +31 15 2563371. Open Jun-Oct only on sat 14-17. This former synagogue was built in 1862 as temple, to a design of Ir. Leon Winkel. The building houses a permanent exhibition to the remembrance of the Jewish victims in the Second Word War. Porceleyne Fles (Royal Delft factory), Rotterdamseweg 196, +31 15 2512030, . Open 9-17. Around 1750, 32 earthenware factories were located in Delft. Koninklijke Porceleyne Fles is the only factory remaining from that era. It is possible to visit the factory or to participate in a workshop. Entrance: €12,50, children < 12 years free, children 13 - 18 years old €6,25. De Candelaer, Kerkstraat 13, +31 15 2131848, . De Candelaer is a little porcelain factory in the inner city. It is possible to visit De Candelear. Molen de Roos (windmill), Phoenixstraat 112, +31 71 5012672. It is possible to visit the mill if the blue flag is flying. For a group visit, call ahead. Artilleriemagazijn( Artillery Depot), Paardenmarkt 1. As a result of the reformation around 1572, many cloisters were abandoned. This happened to the Clarissenklooster as well. It became a warehouse for sulphur, saltpeter and cannon. In 1637 a small tower for firepowder was built. In 1654 this tower exploded, destroying a large part of the city. After this it was rebuilt. It is not open for visitors. Science Centre Delft, formely Techniekmuseum (Technology Museum), . This museum, run by Delft University, is housed in a beautiful building. Activities aimed at children are there to touch and be handled. Really good stuff for the 8 to 14 year olds. Vermeer Centrum DelftThe Vermeer Centrum Delft offers mostly souveniers of the famous Delft painter Johannes Vermeer. Lambert van Meerten A collection of Delft ware, closed in 2013 due to austerity measures. Paul Tetar van Elven Museum Paul Tetar van Elven has a collection of Oriental ceramics and Delft Blue ware of the 19th century. Botanical Garden The Botanical Garden of the TU Delft is an oasis of peace. Griffioen This collection illustrates the development of medicine. Because the collection is of a specialist nature, the museum is only open by appointment for groups of a minimum of 10 people. Delft Historic Tobacco Museum Besides ethnoghraphic pipes from almost every part of the world, you can see implements, tools,old packaging relating to cigars, cigarettes, snuff, chewing tobacco and pipe tobacco. Hofje van Gratie, Van der Mastenstraat 26-38. This was a hofje for single women, founded in 1575 by Pieter Sasbout. It was originally situated on Korte Geer, but, with the expansion of the Armamentarium, it was relocated to its current location. Hofje van Pauw, Paardenmarkt 54-62. This hofje was built in 1707 as stated in the will of Elizabeth Pauw. Klaeuwshofje, Oranje Plantage 58-77. This hofje was meant for unmarried or widowed Catholic women. It was founded in 1605 by Dirck and Elizabeth Uyttenhage. Stadhuis (Town Hall), Markt 78. After a fire in 1618 after which only the tower remained, Hendrick de Keyser rebuilt the town hall. He reused the tower and some remaining walls. In 1620 construction was finished. The building was renovated in the 19th century. 'Hugo de Groot (Hugo Grotius), Markt. On the market you will find the statue of Hugo Grotius (10 April 1583 – 28 August 1645). Grotius is the latin version of the Dutch name Hugo de Groot. Grotius was a jurist in the Dutch Republic. He laid the foundations for international law and law of the sea. In 1618 Grotius was sentenced to life imprisonment to the Loevestein Castle, about 75 km south east of Delft. Grotius managed to escape in a book chest. Both the Rijksmuseum in Amsterdam and the museum Het Prinsenhof in Delft claim to have the original book chest in their collection. 'Apotheek De Salamander, Markt. On the market you will find this old fashioned pharmacy. The gable is adorned by a traditional Gaper. The pharmacist -in white lab coat- provides proper care and attention far beyond current standards. Vleeshal (Meat Hall), Voldersgracht 1. Built in 1650. 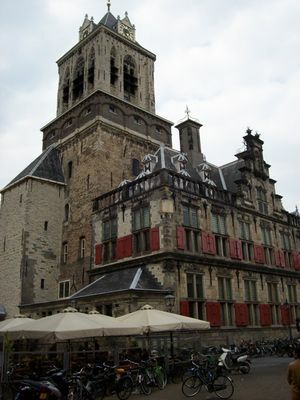 It is one of the only Hollands Classical buildings in Delft. Originally a meat market, later it was converted for wheat. Nowadays it is a youth society. It is possible to eat here for a modest price (around €4). Visbank (Fish Trade), Cameretten. Fish market, one of the oldest shops in the world. Try a traditional Dutch herring. The taste holds between raw tuna and "gravad lax" (cured salmon). The antique shop opposite the Visbank is the most photographed building in Delft. Note the fence. It is a depiction of the solar system. Vrouwenregt, in this short street along a from Vrouw Jutteland, is at the back of the New Chuch. Note the little warped house on the corner closest to the church. It featured in the "Girl with the pearl earring", a film about the painter Vermeer and every tourist takes it picture. VOC-Huis (Dutch East India Company House), Oude Delft 39. The VOC consisted of 6 chambers. One of them was located in Delft. Delft had a harbour (Delfshaven) at that time, next to Rotterdam. The harbour was later engulfed by the growing city of Rotterdam. Oostpoort (East Gate), Oostpoort 1. The eastern gate to the city, built around 1400 and of the four original gates the only surviving one. Small building. It looks kind of cute. It is not on the famous painting by Vermeer (because that's the South Gate), as many tourists wrongly think. Agnetapark, Agnetapark. Just northwest, 10 min walk outside the inner city, this small park was built around 1880 by a local factory owner for his workers. It is the first garden city in the Netherlands. It contains the house of the owner and small working-class cottages and has been a state monument since 1989. Beestenmarkt, Beestenmarkt. Just 2 min from the main square you find the Beestenmarkt. This is a tree covered square with restaurants, cafés and bars all with outside seating. Very busy all year round. Many pubs have patio heaters to provide comfort after sunset. One of the pubs even provides a sand pit for the children. The name of the square refers to cattle (beest is animal) market which used to be held here. During December / January an ice rink is build on the square. Stroll through town: suggested streets: Oude Delft, Boterbrug, Wijnhaven, Hippolytusbuurt, Choorstraat, Vrouw Jutteland, Rietveld, Kerkstraat, Markt ending at the Beestenmarkt for a refreshment. Most tourists arrive by bus next to the New Church. Climb Nieuwe Kerk (New Church) tower. The Hague, Rotterdam and Leiden can be seen from the top. On clear days even Utrecht and Amsterdam can be visible. Botanische Tuin (Botanical Garden), Julianalaan 67, +31 15 2782356, . Open Mon-Fri 8:30-17;00, Sa 10:00-16:00, Su (only May-Sep) 12:00-16:00 . The botanical garden of Delft University houses a large collection of 'utility' plants, both in greenhouses and a nicely laid out park. Good place to spend a few quiet hours on a sunny afternoon. €2, free for TU Delft students. The Canal taxi boat takes you to all the main tourist spots. You can flag a boat on the canals or you can order one by phone on 06 - 22 99 2795. Single fare €2,50 per person. It is also possible to rent the whole boat for € 35,00 per hour for max 8 persons, it will pick you up from where you want. Petting Zoo (Kinderboerderij Delftse Hout) on the Korftlaan 3, is a 15 minutes walk from the city centre, via the "Koepoort" Bridge. Opening hours 10:00-16:00. Admission free. Waterpark, next to the Petting Zoo Delftse Hout. You will find this park geared towards young children. A beach, swings, slides, a cable slide, clean toilet facilities and a maximum water depth of 40 cm (1 ft 3) and free admission make this a popular destination on sunny days. Same entrance as the Petting Zoo. The gate to the waterpark is half-way on the left. Play grounds. Delft has five outdoor play grounds. These are outdoor areas with swings and various climbing frames. Target audience: 2 till 12 year olds. The biggest is the one on the Beukenlaan 1. The admission is free. It has toilet facilities and a simple shop for coffee, drinks and ice cream. On sunny days the volunteers sometimes run blow-up paddling pools. Opening hours, Monday till Friday from 13.30 till 17.30 hour. Kids Playground Delft (Kleveringweg 35 2616 LZ Delft Tel. 015-2190673) On the other side of the A13 motorway behind the Mc Donalds restaurant is an indoor playpark. Although staff motivation and facilities both need a polish it can provide a channel for excess child energy on rainy days. Wednesday to Sunday 10:00-18:00 admission €7 childeren and €1.80 per adult. Every week, Studium Generale organises lectures on a wide range of subjects. Usually these are in Dutch, but roughly once a month there may be one in English too. The lectures aim at the interest of students, but other people interested may often attend as well. Admission is usually free . There are a few theaters in the inner city; Theater de Veste, Vesteplein 1  is the largest theater, with shows almost every night (except during summer). The Microtheater, next to the New Church is a small theatre with around one show per week. There are two cinemas in Delft. Filmhuis Lumen is a small pleasant cinema run mostly by friendly volunteers. It has a very nice foyer. It shows mostly non-Holywood and art-house movies. Also the film "Girl with the pearl earring" is shown here once a week. Doelenplein 5 . Hollywood blockbusters can be seen in Pathé Delft, Vesteplein 5 . This is a new, large scale cinema near the Theater de Veste in the Zuidpoort (big screen, large comfy seats, expensive drinks and pre-made perfectly round popcorn). Tour the sights of Delft in a horse drawn tram if you like a bumpy ride surrounded in the smell of manure. It starts on the market square. Open Monumentendag ("day of the open monuments"), on this national event, many monumental buildings can be visited for free, which are otherwise closed to the public. This includes climbing to the top of "Molen De Roos", the windmill on Phoenixstraat 112, and visiting the former city prison and torturing room (backside of the City Hall), where the alleged murderer of William of Orange was tortured in 1584. It usually takes place on a Saturday. Inform at the tourism office when the next open monumentendag is held. Muziek op de Gracht ("Music on the canals"), in July and August free concerts are given on boats on the Vrouw Jutteland Canal. Traditional Delft pottery. Avoid anything that says "Holland" on it, or depicts windmills. Check out the antique stores if you want something really traditional. The shopping area in the city spreads roughly from the "Zuidwal" on the south to the "Choorstraat" on the north. The national and international stores like C&A, H&M and McDonald's concentrate on the southern part of the city, while the more alternative small stores and gift shops can be found more to the north. Apart from some supermarkets, shops are usually closed on Sundays and on Monday mornings. Vrouwjuttenland: In this short street along a canal, near the New Church, alternative clothing and gift stores can be found. Pipe or cigar smokers should definitely visit "Van Renssen". The street also contains a organic / health food supermarket. On summer evenings, once a week there are performances of musical artists, performing from a boat on the canal. Check the health food supermarket for the exact dates. Oostsingel: Opposite the Vrouwjutteland the canal continues into a street with houses. Just on the right at number 277 a beer shop is located. I sells 700+ different beers. Most of their sales people are quite knowledgeable. The shop is called "Flink Gegist" which translates into "Considerably Fermented". Choorstraat: Just around the corner from the Vrouwjuttenland, the Choorstraat can be found. This pleasant small street offers a variety of stores, like a drugstore selling all sorts of tea, an international gift store selling everything from tajinnes to buddha statues, a chocolate store, a gameshop and a large book store with many international newspapers. Hippolytusbuurt: At the end of the Choorstraat, untill Wijnhaven is Hippolytusbuurt. This is one of the two major canals. It boasts the one of the oldest shops in the world. The Fish shop dates from 1342. The Tourist information point is here. A funny little sweety shop, two toy shops, two hairdressers, a maroccan butcher with an excellent selection of olives and tapanades and two upmarket restaurants. Bastiaansplein: The newest shopping area in town, consisting of a large supermarket (7 days a week open until 10:00PM) and several clothing stores. Tiles in the street light up at night. Voldersgracht: For those who need good advise on tasteful alcoholic beverages, they definitely should visit the store Wines and Whisky's. Furthermore the Voldersgracht holds a large record shop, which sells a wide range of LP's and CD's from all ages. The street also has a religious gift shop, the Bijbel-In. Martinus Nijhofflaan: The "Hovenpassage" is a covered shopping area, 15 minutes of walking outside the city centre. The shops are smaller and less alternative, but it contains a wide variety of stores and a large supermarket, the "C1000". Another large supermarket, the Albert Heijn, is on the other side of the street. Oude Delft: Wine shop "Van Dorp" is located near the Old Church. The shop is in the vaulted basement of a monumental house. The atmosphere inside is cool and tranquil and worth a visit by itself. The shop has an extensive selection of wine in every price category. The customer service is highly personal and very friendly. Because the shop doesn't lend itself to much browsing the shopkeeper (a wine connoisseur himself) will try and find out what is to your liking and then recommend a suiting wine without pushing expensive wines. The venue can also be hired for wine tasting sessions. A visit here will cure you from supermarket wine forever. 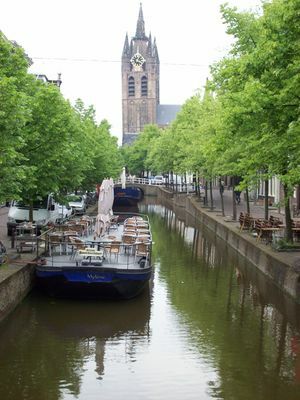 Delft has an enormous amount of restaurant and eating houses. Some are good and some are less good. Price is no indication for quality. A greasy spoon can give you a new culinary experience by trying the "Kapsalon" a kebab with chips, topped in cheese in the oven and covered salad. And a expensive place may leave hungry and unsatisfied. Do some research first, most places have been reviewed on various websites. The café Kobus Kuch, Beestenmarkt 1 , has a nice choice of lunch breads, but is probably best known for its home made pies, and particularly its appeltart with whipped cream. If the personnel is not too busy to bake one for you, you can even order an entire pie to take home. At Lunchroom Leonidas, Choorstraat , named after the Belgian chocolates (which they sell too) has nice lunch breads and a wide variety of tea. During summer time you can take your lunch out in the patio at the back. Bonus here: no background music! Kleyweg's Stads-koffyhuis, Oude Delft 133 , is a favorite lunch place of many locals and undoubtedly sports the best sandwiches in town. It can be a bit crowded around lunch time however, so be on time. Otherwise stop there for coffee, Dutch coffee is consistently excellent, and goes well with the ubiquitous (and delicious) Dutch apple cake. 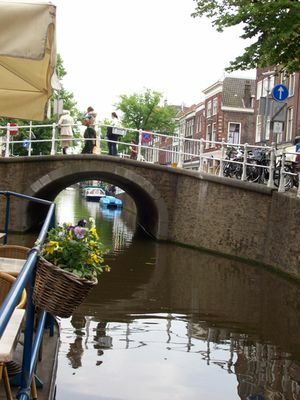 It has a terrace boat in summer time which provides a lovely view of the oude delft canal. The restaurantSan Marco, Brabantse Turfmarkt 23  , Serves some really nice pizzas,the interiors is as old as....unknown the restaurant was started in 1979,go there for a nice Venetian feel,nice place for a date . On Thursday and Saturday a market is held in Delft centre. Fresh produce, fish and flowers and non-food at bargan prices. Services like watch repair and mobile phone unlocking are also available. Try the sweet smelling freshly made "Stroopwafels" (syrup waffles). Try a herring or "Kibbeling" deepfried battered fish. Ciao Ciao , Binnenwatersloot 38, +31 15 2121313. Very good, freshly made pizza and pasta. Usually a free taster comes before the meal while you are waiting. Everything is made to order. The kitchen in full view. Remarkably cheap pizza's and pasta's. Also does catering. 7 days a week 14.00 - 10.00 p.m. No reservation needed. Pizza €5-7.50, Meals €10-14.50, Drinks €1.50. Uncharacteristicly this cheap restaurant has a very good house wine. Wines are sourced by "Van Dorp" wine merchants mentioned in another section of this page. Pizzeria Dennis , Nieuwstraat 8, +31 15 2158677 . Reasonable pizza's and middle eastern dishes (shoarma/kebab). Relatively cheap. The place is much more oriented on take-aways then on eat-ins. 7 days a week 4.00 - 10.00 p.m. No reservation needed. Pizza €5-7.50, Meals €10-14.50, Drinks €1.50. Has a nice website especially the registered users section. De Verbeelding Verwersdijk 128, 015 212 13 28 This restaurant is very popular nearly always full. You have to make a reservation if want to eat here. It promotes a set 3 course menu for 24.50. The price / quality ratio is excellent. Ladera, Oosteinde 123, +31 15 2125950. Affordable traditional dutch menu. Join the locals for a chat at the main table, have your own table, or eat in the garden (out the back, not indicated). Weekdays 4:30 - 8:00 p.m. Service fast and friendly, no reservation needed. Ask for special dishes, not indicated on the menu. Dinner €6.50-9.50, coffee €1. Vlaanderen, Beestenmarkt 16, +31 15 2133311 . Nice location for lunch or dinner. Excellent food, gorgeous presentation, extensive winelist, not cheap, sometimes activities take place, such as an open stage. Check out the patio at the back. When making reservations ask for the patio. Lunch €10, dinner about €30, 3 course menue about €35. The menu has theme ans changes every three months. Café de V, Voorstraat 9, +31 15 2140916 . Excellent food, probably the best price/quality ratio in Delft. Daily menu at unbeatable prices (except maybe "De Ruif"), about €7.50. Dinner about €10-20. Eetcafé de Ruif, Kerkstraat 22-24, +31 15 2142206 . Excellent food at acceptable prices, the best place in Delft for a sunny summer day, food served in the garden and on a barge with sunshine till late in the evening. Daily menue at low prices is usually out at about 20:00h, dinner about €15-20. Stadscafé De Waag, Markt 11, +31 15 2130393 . Not so simple restaurant, caters often for groups. Prices are OK.
LEF Restaurant, Doelenplein 2, +31 15 2120617 . Very nice Paris bistro style restaurant/bar. Sit outside under the trees in the summer. Great place for sundowners. Sandpit for the kids available. Great food, low prices. €12-18. Olympia, Hippolytusbuurt 43, +31 15 2136579 . Greek restaurant. Lots of seats, but cozy atmosphere. Outside terrace with a view of the Oude Kerk. Large portions of good quality food, mostly so much meat that you cannot (and shouldn't) finish you plate. Try the specials at very reasonable prices. Also, very fast service. Main courses €15-25. Malee, Voldersgracht 29, +31 15 2120781 . Authentic Thai food in a small restaurant. Every day, "auntie Malee" cooks a 3 course dinner for her guests. Not as spicy as you'll get in Thailand, but still a treat for your taste buds. Reservation advisable for larger groups. 3 course meal €15. Closed on Mondays. Mañana Mañana, Verwersdijk 124, +31 15 2141472 . A wide variety of tapas in a Spanish restaurant, also much choice for veggies. A bit outside the city centre, but worth the walk. 3 course meal around €20-25. 'Le Vieux Jean', Heilige Geestkerkhof 3, +31 15 213 04 3  Opening hours Lunch: 12.00-14.30, Diner 18.00-22.30. Le Vieux Jean is an expensive French restaurant with very good food. Expect to pay 80 euro per person for a starter, main, desert and wine. The restaurants has a very extensive wine list. Make sure you reserve seating in the downstairs restaurant. A private room is available. Their (lunch) menu will satisfy the most critical customer. Expect the highest quality in both the service and food in Delft. The price reflects this. Stadsherberg De Mol, Molslaan 104, +31 15 2121343 . Who wants to eat having a medieval experience, should definitely visit this restaurant. Bring a bag of money, it's not cheap. Maharani, Nieuwe Langendijk 59, . One of the better Indian restaurants in the area, and slightly cheaper than it's Den Haag based counterpart. Popular also with Indian expats and foreign students. Vegetarians must try the Vegetarian Tandoori Paneer. Expect to pay around €14-17 for a vegetarian dish or €16-20 for something with meat. Notice that the multi-person menu's are not calculated per menu, but per person. Peking, Brabantse Turfmarkt 78, . One of the many Chinese restaurants in town. Also popular for take away and delivery. Chinese food to take away is served in large quantities. Expect to feed four people with a meal for two. A take away meal for four people will set you back around €14-17. Daily Wok, Oude Langendijk 23d, . Concept restaurant where Asian food is prepared in an open kitchen. Very good deal at €5-6. Very popular with students. Bram Ladage, Paradijspoort 8. Traditional chips or fries made from fresh thick-cut potatoes. Fries from Ladage are the best you can get. Anywhere. Potatoes are cut on the premises and hand cooked, no frozen factory chips here. Fantastic taste and quality. Go native with mayonnaise or satay sauce (peanut-butter sauce). A combination of the two is also possible for the very brave. Excellent deal at €2-3. Popular finger food. De Parel van Flores, Voldersgracht 31, +31 15 2130946 . Authentic Indonesian cuisine (unlike the other indo-chin-thai places in town). Family owned with reasonable prices and OK food. The service and quality get mixed reviews. No reservation needed. Appetizers €5, Meals €10. Restaurant Het Klooster, Vrouwjutteland , New spin off from the Belgian beer pub next door. Nice concept: most dishes are made with beer. Pleasant location and layout. Decent prices, modest portions. The service is very european. If you are on a really tight budget, many student societies provide food, for a modest price (around €4). To check what is on offer look here: . Try the local Delftse Mueselare Bier. Al fresco at one of the many bars around the market square, or on a floating terrace (apparently unique to Delft) on a canal. "De Beestenmarkt"; around this square in the city centre are many pubs and bars. In the summer it is filled with people drinking a beer under the maple tree canopy. Many students get a drink at their fraternity (extremely cheap). Mostly you need to be a member or be introduced. Jazzcafé Bebop, Kromstraat, a good café where the music is not so loud that you can't hear each other speaking, where the bartender is friendly and the visitors are on average around 25-30 (outside the weekends maybe somewhat older). It has a wide variety of beers and during summer the patio at the back is open. Bier café Het Klooster, Vrouw Jutteland, is a beer café with an excellent (200+) selection of beers. It is very small but you can sit outside and enjoy a very beautiful view. There is no TV so football supporters avoid it. The restaurant next door cooks with the special beers. Not only the beers are foreign, the café is popular hang out for international students and expats. The Koornbeurs (alternative student fraternity and youth society, no membership needed) has a disco on Friday and a metal underground scene on Saturday. The average age of the visitors is about 17. Bierfabriek. A new place where beer is brewed on the premises. Here you can dance during the weekend. Youngsters untill 24:00 hour. After that the avarage age is about 22. Open late. The Lorre. This is a student disco that belongs to a fraternity (DSC). It is open to students on tuesday and thursday. Cannabis (Coffeeshops). Use of cannabis, weed or hashish is not policed in small amounts (5 grams or less) in The Netherlands. Dutch law enforcement tolerates its use in so-called coffeeshops. There are 5 coffeeshops in Delft. The Future in the Peperstraat 8, de Vlouw on the Vlouw 27, The Game on the Breestraat 30, 't Keldertje on the Kromstraat 22a and De Boeddha on the Achterom 19a. The Game and The Future are both exceptional places for Lattes and herbs. edit Out of all the coffeshops only Boeddha, de Vlouw and the Game have seating. The Game requires a Dutch ID. de Vlouw is worth a visit, high quality weed and awesome themed interior. It has pinballs, pool tables and good music. Boeddha is smaller with less people and cheaper weed but still very cozy atmosphere and friendly staff. Hotel Coen Delft, Coenderstraat 47, +31 15 2145914 . Comfortable, clean, reasonably priced and right next to the railway station, the only hotel in Delft offering a free sauna for it's guests. Also offering a free WiFi service and a lobby computer. 40 rooms, double room €110, breakfast €12. Hotel de Emauspoort Delft, Vrouwenregt 9-11, +31 15 2190219 . Right behind the New Church. 23 rooms, double room €100, breakfast included. Hotel Grand Canal, Breestraat 1, +31 15 2157133 . Housed in a historic building (former city prison and VOC building) overlooking the canals, 2 minutes from the railway station. Clean and well-furnished, not very wheelchair-friendly. WiFi internet. Double room €95/150, breakfast €16. Hotel de Plataan Doelenplein 10 +31 (0)15 212 60 46  Unique and stylish hotel. Themed rooms are available. Look at their website for details. Great location, reasonable prices. Free WiFi. Single/Double room €99/114. breakfast €15. There are several bed and breakfasts in Delft . There are three campgrounds in Delft. Camping Delfse Hout is located near a small artificial lake, suited for swimming. A camping spot for two persons, including a car costs between €19,5 and €24. Cabins (for three/four persons) are also available for €36. Cottages can be rented for €265 per week. Services include a restaurant, recreation room, supermarket, launderette, playground, table tennis, bike rent, swimming pool. This is not a quiet place. Korftlaan 5, tel: 015 2130040. If you look for a smaller setting, try Uylenburg . Sites cost €10.5 for a tent/caravan/camper or €7.5 for a two person tent. Additionally you have to pay €2,5 per person. There is also a very pleasant guesthouse. Rooms are €45/50/75 for 1/2/4 persons. Breakfast is €6 per person. Tel. : 015-2143732, e-mail: [email protected] Since 2013, Uylenburg no longer has a campground. Even smaller is De Grutto. This is definitely only for the real nature lover. You have to be a member of NIVON to camp here. There are only 25 spots. For more information call Mrs. W. Klunder tel. 079 - 341 83 25 (18.00 - 20.00). Directions, take bus 64 from Delft Station. Ask the driver to let you out at Rietzangerstraat, it is a 30 minute walk from there. The european telephone number for emergency care is 112. Fire, ambulance or police can be called out on this number. Mobile phones without caller credit can still call this number. Family doctors (GPs) outside working hours (8:00 till 17:00) and for non-registered patients can be found at the "huisartsenpost", Reinier de Graafweg 3a, 2625 AD. (the white portacabin, next to the ambulance entrance), telephone (015) 251 19 30. Call before you visit. Visit: € 65,14, consultation at home: € 97,40. Paid parking on hospital grounds. For prescription medication outside working hours, go to Apothecary "Buitenhof Apotheek" on the Rossinistraat 1, 2625 AP Delft. Telephone: (015) 245 42 00. There are several church services available also in English. Some of them offer partly English spoken services, others offer translations by a headset or written on paper (both handed over at the entrance). The list below is not complete, but gives an impression of the possibilities. Take tramline 1 to Scheveningen. It terminates right on the beach. It takes about 1 h to get there (the same trip by train is faster, you have change in Den Haag). Also, rent a bike and go exploring, go west to go to The Hague. Schipluiden is a very small town and a popular watering hole for cyclist. Cycling to Hoek van Holland is nice when you want to see the big sea going ships. The whole route from Rotterdam to the Hoek of Holland has a excellent cycle path. Great views. If you only want to cycle one way there is a train station at Hoek van Holland. You can take your bike on the train for about 7.50 euro. You can cycle to The Hague in 30 min. Start at the Oostsingel and follow the canal. It is well-sign-posted. Also, The Hague is visible as soon as you leave Delft. This page was last edited on 8 January 2019, at 14:09.